The top hardcover was Batman: Knightfall Omnibus Vol. 3: Knightsend. The Infinity Gauntlet collection was yet again the top trade paperback. The top reordered comic book from DC was Batman: Prelude to the Wedding: Robin Vs. Ras Al Ghul #1. It went on sale on May 30. DC also had the top reordered comic book released in June, Justice League #1. 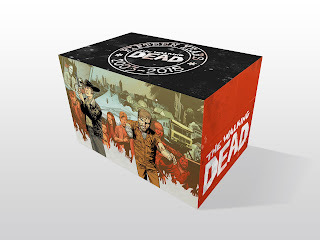 The Walking Dead Compendium 15th Anniversary Box Set was the top advance-reordered item by dollars. Priced at $200, it goes on sale October 3. The Jim Lee variant of Batman #50 was the top advance-reordered comic book, with the regular edition right behind. It goes on sale July 4 as part of the midnight-release promotion many shops are participating in. The Fresh Start relaunch Amazing Spider-Man #1 was the top advance reordered comic book from Marvel. 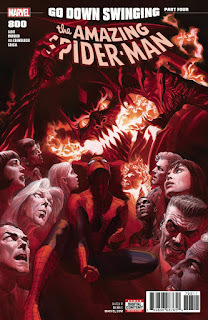 The 56-page issue has a discount program keyed to retailer's orders of Amazing Spider-Man #796. Marvel also had a lot of Captain America #1 variants in the chart. No trade paperbacks made the list. We've seen enough reorders and advance from the past few weeks from Diamond Comic Distributors to be able to collate some information onto pages for May 2018, June 2018, and July 2018. Check them out for a further glance at the future.